ITEM #5623: SHEAFFER PFM II IN BLACK WITH STAINLESS CAP AND CHROME PLATED TRIM. NEEDLE POINT PALLADIUM SILVER NIB THAT WAS SMOOTHED BY RICHARD BINDER. ITEM #5724: SHEAFFER STYLIST BALLPOINTS WITH ALLIGATOR CLIPS. N.O.S. With no fillers. To buy please email Pentooling. Be sure and provide a shipping address so a shipping cost can be calculated. Also please make sure that Paypal has your correct shipping address, as I use them to generate shipping labels. ITEM #5696: METAL SHEAFFER ADVERTISING SIGN, 6" x 15". Have (2). ITEM #5718: SHEAFFER 330 IMPERIAL PENCILS. NOS. Available in dark blue, burgundy and black. ITEM #5651: SHEAFFER BLACK RINGTOP VEST POCKET PENCIL. Gold filled trim. Mechnism works great. Crisp imprint. ITEM #2602: SHEAFFER SLIM TARGA #1024 FLUTED STERLING SILVER FOUNTAIN PEN. Very broad nib. New old stock. No dents or dings. This item has not been polished as most of my customers prefer a patina on sterling. Includes original hard to find slim Targa converter. ITEM #2603: SHEAFFER SLIM TARGA #1024 FLUTED STERLING SILVER PENCIL. New old stock. No dents or dings. This item has not been polished as most of my customers prefer a patina on sterling. ITEM #5591: SHEAFFER NO NONSENSE IN A DARK CORAL COLOR. Has a Fine steel nib and a Sheaffer piston converter. Chrome trim including a disc in the top of the cap. New old stock. ITEM #5602: SHEAFFER SLIM TARGA STERLING SILVER FLUTED FOUNTAIN PEN #1024. NEW OLD STOCK. Very BROAD nib with a tiny bit of flex. This is a new pen, intentionally left un-polished as most of my customers prefer a patina on sterling. For that reason the photos do not do it justice. However, other than the tarnish on the silver, this pen is in as-new condition. The pen can be polished upon a buyer's request. ITEM #5603: SHEAFFER SLIM TARGA STERLING SILVER FLUTED FINE (USES .036" LEADS) PENCIL #1024. NEW OLD STOCK. Intentionally not polished to retain the patina. ITEM #5604: SHEAFFER CLASSIC DIAMOND SQUARE SILVER PLATED TARGA #1010. Available with 14K Broad nib. New Old Stock. Comes with Sheaffer piston converter. ITEM #5611: SHEAFFER PFM I IN BURGUNDY WITH CRISP ITALIC NIB, .053" WIDE AT TIP OF X BROAD NIB. New old stock. Chrome trim. ITEM #5604: SHEAFFER CLASSIC SIZED TARGA 1010. DIAMOND SQUARE SILVER PLATED. 14K nibs, available in XFine and Broad. Include Sheaffer piston converter. NEW OLD STOCK. ITEM #5599: WASP CLIPPER IN GOLD CIRCUIT BOARD PATTERN AND PLUNGER FILLER. Medium 14k Wasp #4 nib. ITEM #5608: SHEAFFER BLACK CHASED HARD RUBBER WITH FLEXIBLE MEDIUM/FINE (right on the boundary between the two grades) No. 2 'SELF FILLING' NIB. Crisp chasing and imprint. Gold filled trim. ITEM #5570: SHEAFFER MODEL 1011s SLIMLINE TARGA IN GOLD PLATED BARLEYCORN PATTERN. NEW OLD STOCK. Includes a hard to find Slim Targa converter. Available in 14K Broad & Medium nibs. ITEM #5575: SHEAFFER SLIM TARGA MODEL 1010 CT IN SILVER PLATED FINISH. NEW OLD STOCK. 'DIAMOND SQUARE' PATTERN. Includes a hard to find Slim Targa converter. 14K Medium / Fine nib - right on the border. ITEM #5571: SHEAFFER MODEL 1007s SLIMLINE TARGA IN GOLD PLATED SQUARE PATTERN. NEW OLD STOCK. Includes a hard to find Slim Targa converter. Fine 14K nib. ITEM #5572: SHEAFFER MODEL 1005s SLIM TARGA IN GOLD PLATED FLUTED PATTERN. NEW OLD STOCK. Includes a hard to find Slim Targa converter. Medium 14K nib. ITEM #5573: SHEAFFER MODEL 1003s FIRST EDITION SLIM TARGA IN MATTE BLACK FINISH ON METAL. GOLD PLATED TRIM, NEW OLD STOCK. Top jewel is matte black, not gold plate. Includes a hard to find Slim Targa converter. Medium 14K nib. ITEM #5566: Clipless Lady Sheaffer Skripsert VIII Balicon Black on Gold Fountain Pen and Pencil set. Needlepoint stainless conical nib. Cartridge filling. Pencil uses .036" leads and it works great and it has the original price sticker on it (the pencil). No darkening of gold fnish. ITEM #5567: Clipless Lady Sheaffer Skripsert IX Balicon Red on Gold Fountain Pen and Pencil Set in Tulle pattern. With recessed gold nib unit. Red section. ca. 1963-64. Pencil uses .036" leads and works great. Pen is cartridge filling and still has X Fine chalk mark on the section. No darkening of gold finish. ITEM #4028: VACUUM-FIL RED / PEARL MARBLE LEVER FILLING FOUNTAIN PEN. Has a heavy FINE "VACUUM FIL MADE IN USA" size 2 nib. This is the first lever filling Vacuum Fil I've run across; I've always assumed from the name that they were all plunger fillers - that's not the case. This one has demonstrated a .9 cc capacity. It measures 4 3/4" long X .471" dia. ITEM #4914: Clipless Lady Sheaffer Skripsert IV - Paisley Gold on Black. New old stock. Fine steel nib. Cartridge filling. Can use the push button converters. The squeeze (Aerometric) type and the piston type Sheaffer converters are both too long. ITEM #5289: SHEAFFER 8J-2 STAINLESS TWO COLOR WRITING BALLPOINT, NEW OLD STOCK, IN BOX. Red and Blue fillers still work. This piece is out of the '80s. ITEM #5265: SHEAFFER BALANCE WITH 2 TONE BROAD/MEDIUM SERIALIZED NIB. This pen has a long blind capwith no apparent purpose other than possibly dialing a phone. the blind cap material is different from the Celluloid that the rest of the pen is made from; it's softer and has a duller surface. The band has the letters "G. E. W." Gothically engraved on it. Strong Sheaffer imprint and smooth nib, right on the boundary between Broad and Medium on a Parker factory nib gage. This isn't an oversized balance, but it has an approx .040" larger diameter than the slimmer balances. Strong imprint. Lever filler. ITEM #5180: SHEAFFER TARGA LACQUE MARBLE GREY CLASSIC FOUNTAIN PEN. A gorgeous marbled grey metal pen w/ lacquer finish and gold plated trim. Very broad inlaid 14K nib. Cartridge filling. Catalog #1028. ITEM #4966: SHEAFFER CONNAISSEUR SET IN BURGUNDY. MODEL 811 BALLPOINT AND MODEL 811 FOUNTAIN PEN. Mint condition in box. BROAD sperical tip on 18K nib. Fountain pen comes with Sheaffer Aerometric converter. Both pens cat. no. 811. ITEM #5024: NOS SHEAFFER IMPERIAL 330 CARTRIDGE FILLER WITH LABEL & CHALK MARKS. 14K Medium nib. Very much like the day it left the factory. ITEM #5122: SHEAFFER STERLING SILVER BALLPOINT. Gold plated trim and pocket protector clip. The clip actuates the filler pop-out action and won't let you slide it over your pocket if the point is out. ITEM #5114: SHEAFFER GOLD PLATED VICEROY DESK BALLPOINT. Twist actuated. Has the word 'Kreisler' engraved or stmped onto the very thin band. ITEM #5113: SHEAFFER NoNonsense ballpoint celebrating the 50th reunion of the Ft. Madison High School class of 1943. ITEM #5038: SHEAFFER NEW OLD STOCK 330 IMPERIAL PEN. Inlaid stainless steel nib with medium spherical tip, chrome trim, cartridge filler. No flaws. ITEM #5029: CHROME TRIUMPH IMPERIAL WITH HUGE, VERY BROAD 4° ITALIC STEEL NIB. .080" wide. The italic nib is more toward a cursive italic rather than a crisp italic in that the writing pad has a bevel to it. The rest of the corners are fairly sharp. New old stock. Includes sheaffer converter. ITEM #4088: SHEAFFER OVERSIZED PISTON FILLING BALANCE PEN IN BROWN / GOLD STRIPES. Recently fitted with a new old stock Sheaffer factory repair rear seal, this pen has been tested for intake and it takes in a whopping 2.7cc! That's huge. This pen comes with a MEDIUM two tone Sheaffer's serialized Lifetime nib. No brassing on Gold Filled trim. 5 1/2" long X .586" dia @ cap band. Crisp Imprint. ITEM #4645: WASP $1.95 CLIPPER IN BROWN CIRCUIT BOARD PATTERN. MEDIUM WASP #4 nib, gold filled trim, and fairly clear ink view window in section. ITEM #4248: No. 1000 SHEAFFER OVERSIZED BALANCE PEN IN GREEN/PEARL STRIPES. Gold filled trim with no brassing. FINE Sheaffer lifetime nib with very strong barrrel imprint. 1/8" gold filled band. Lever filling. To buy please email Pentooling. Be sure and provide a shipping address that the US Postal Service will accept. If you're outside the US, try your address on Google Earth. If they can find it, it is probable that the USPS will accept it. ITEM #4489: SHEAFFER No. 8 TRANSITION PEN. Made by Sheaffer with a left-over cap that was used on the '28 model 8C flat top and a barrel introduced around '29 or '30 for the new oversized balance pen. This pen has a MEDIUM serialized nib. (Serialized nibs were used starting in about '26). ITEM #4490: SHEAFFER CALENDAR BALLPOINT. Has crisp, clear calendar dates on a cream colored barrel - these are usually worn. 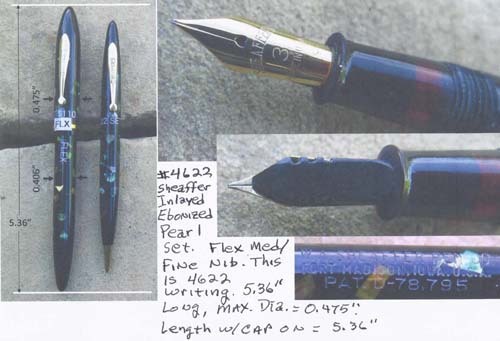 As Susan Wirth likes to point out, both Sheaffer and Parker used the same company to produce their calendar rings for their ballpoints, so this is the same piece of trim that Parker used on Jotters. In near mint condition. This pen uses the Sheaffer "Interim" style filler with a triangular plastic plug on the back end. The filler is actuated by rocking the clip. ITEM #3749: NEW OLD STOCK SHEAFFER GOLD PLATED SOUVEREIGN LINED PATTERN CARTRIDGE/CONVERTOR FILLING PEN. With Fine inlaid 14K nib and no dents, dings, or brassing. Could be outfitted with a Broad Palladium nib for the same price. To buy please email Pentooling. Be sure and provide a shipping address so shipping costs can be quoted. ITEM #4411: SHEAFFER NOS BALLPOINT WITH "REMINDER" CLIP. Chrome and turquoise. The clip prevents it from being clipped onto a pocket if the point is out. Actuation is affected by rocking the clip back and forth. ITEM #4388: NEW OLD STOCK SHEAFFER TARGA 1011 / 16111 FOUNTAIN PEN w/ FLEXIBLE BROAD NIB AND EXTRA ROLLINGBALL FRONT END. - One pen body/cap with two different front ends allowing you to have either a BROAD FLEXIBLE fountain pen or a rollerball (Sheaffer called them "Rolling Balls"). The body has a gold plated small square pattern and it comes with the original price sticker. The nib is very BROAD and the filling mechanism uses cartridges. A Sheaffer Roller filler is included along with the additional Rolling Ball front end which is easily swapped out with the fountain pen front end. Understand that you're getting (1) barrel + (1) cap + (2) different front ends here. ITEM #4246: SHEAFFER OVERSIZED BALANCE IN GREEN/PEARL AND BLACK. Gold filled trim with no brassing. 1/8" band and MEDIUM Sheaffer Lifetime nib. Lever filling. Very strong imprint. A gorgeous pen. ITEM #4149: SHEAFFER RINGTOP SLIM BALANCE PENCIL IN HOLSTEIN PATTERN. Mechanism works great and color is excellent. The plastic is all stable and nor crumbling. No brassing on the gold filled trim. ITEM #SHEAF BP: NEW OLD STOCK SHEAFFER BALLPOINTS. With clickers & translucent barrels, available in 3 colors, as shown. Please specify color when ordering. These pens come with new sheaffer fillers. ITEM #2545: SHEAFFER TOUCHDOWN DESK PEN IN BLACK. With broad Triumph nib. ITEM #4282: SHEAFFER NEW OLD STOCK CLICK RETRACTABLE BALLPOINTS. Ca. 1962. With super smooth action. Specify color. These come with new Sheaffer fillers. ITEM #4101: SHEAFFER RED HARD RUBBER 3-25 FOUNTAIN PEN. Fine nib. Crisp imprint, no cracks on the cap lip or barrel. There are two very short, tiny and tight corner cracks where the clip penetrates the cap. These are hard to see without a loupe. This pen is amazingly intact for a red hard rubber 3-25. No brassing on the band or lever. ITEM #3740B: SHEAFFER BLACK CHASED HARD RUBBER RING TOP FOUNTAIN PEN. 3 3/4" with elaborate and un-brassed gold filled trim and a #2 FLEXIBLE "SHEAFFER'S SELF-FILLING" fine nib. The hard rubber color is about 100%, although the barrel chasing is weak.Capacity tests out @ .8cc. ITEM #3460: SHEAFFER BALANCE FOUNTAIN PEN. Holstein, 5 3/4" long with cap screwed on, .522" dia. @ cap band. Crisp imprint, color as shown, mEDIUM Sheaffer serialized lifetime nib. The black line on the nib below is a reflection of the camera lens, not a crack. THE ITEMS BELOW ARE INTENDED TO BE ARCHIVES OF PAST SALES AND AS SUCH ARE NO LONGER AVAILABLE FOR SALE ON THIS WEB SITE. ITEM #4918: MEDITERRANEAN BLUE LEVENGER SEAS CONNAISSEUR FOUNTAIN PEN. First series. Medium Sheaffers Levenger 14K nib. Gold plated trim. Cartridge filling with Sheaffer's Aerometric converter included. Cat. no. 830. ITEM #5181: CARIBBEAN YELLOW LEVENGER SEAS CONNAISSEUR. First series. Broad Sheaffers Levenger 14K nib. Gold plated trim. Cartridge filling. Item includes a Sheaffer Aerometric converter. ITEM #5183: SHEAFFER TARGA REGENCY STRIPE CLASSIC FOUNTAIN PEN. A metal pen w/ vertical black lacquer wide lines alternating with groups of 3 gold plated lines. Gold plated trim. Very broad inlaid 14K nib. Cartridge filling w/ Sheaffer Aerometric converter. Catalog # 675. ITEM #5182: SHEAFFERS CONNAISSEUR FOUNTAIN PEN IN BURGUNDY. Broad 18K nib and gold plated trim. Cartridge filling. ITEM #5111: NOS SHEAFFER IMPERIAL TOUCH DOWN FILLER. Black w/ gold filled trim and Fine 14K inlaid nib. Much like when it left the factory. ITEM #4913: Clipless Lady Sheaffer Skripsert VI - Paisley Gold on Periwinkle. New old stock. Medium steel nib. Cartridge filling. Can use the push button converters. The squeeze (Aerometric) type and the piston type Sheaffer converters are both too long. ITEM #5519: Clipless Lady Sheaffer Skripsert X Tulle Gold on White. New old stock, Medium steel nib. Cartridge filling. Can use the push button converters. The squeeze (Aerometric) type and the piston type Sheaffer converters are both too long. ITEM #5574: SHEAFFER MODEL 1000xg SLIM TARGA IN BRIGHT CHROME FINISH. NEW OLD STOCK. Vertical lined pattern. Includes a hard to find Slim Targa converter. 14K broad / medium nib - right on the border. This model came out with the 14K nib aftere Sheaffer discontinued the steel nib on this model. ITEM #4132: NEW OLD STOCK SHEAFFER GOLD PLATED SOUVEREIGN LINED PATTERN CARTRIDGE/CONVERTOR FILLING FOUNTAIN PEN. With Broad inlaid 14K nib and no dents, dings, or brassing. Includes Sheaffer Aerometric style converter. ITEM #5565: Clipless Lady Sheaffer Skripsert I - Tweed Gold on silver tweed pattern with a conical Medium/Fine (right on the border of Medium and Fine on a Parker factory nib grader) gold nib and red section. Cartridge filling. No darkening of chrome / gold finish. ITEM #5263: SHEAFFER FLAT TOP WITH SERIALLIZED 14K FINE NIB. No brassing on the gold filled trim. Lever Filling. There is a fine, tightly welded crack in the cap lip that is difficult to notice. ITEM #4917: AGEAN GREEN LEVENGER SEAS CONNAISSEUR FOUNTAIN PEN. First series. Medium Sheaffers Levenger 14K nib. Gold plated trim. Cartridge filling with Sheaffer's Aerometric converter included. ITEM #5428: 1918 SHEAFFER No. 2 FLAT TOP BLACK HARD RUBBER / NICKEL PLATED TRIM. No. 2 ' SELF FILLING' Flexible Broad nib. ITEM #5517: SHEAFFER VACUUM FILLING BALANCE IN GREEN STRIPES. Mediun 14K nib. No brassing on gold filled trim. ITEM #5351: WASP CLIPPER IN GREY CIRCUIT BOARD PATTERN. Wasp Junior 14K Medium nib. Strong imprint, chrome plated trim. ITEM #4241: WASP CLIPPER STD SIZED IN GREEN LAHN PATTERN (SIMILAR TO PARKER GOLDEN WEB, ONLY GREEN). Pen has had the rear packing replaced with a new old stock Sheaffer replacement packing insert, so the pneumatic filler works quitw well, and will not be falling apart or leaking any time soon. Nickel plated trim. The nib is a BROAD / MEDIUM steel WASP Junior. ITEM #5273: LADY SHEAFFER IN UNCOMMON IRRIDESCENT GREEN WITH ENGRAVED PATTERN. Broad 14K nib. Comes with an Aerometric type Sheaffer converter. ITEM #5264: SHEAFFER BALANCE WITH INLAYED EBONIZED PEARL. Fine two tone Feather Touch no. 5 nib. Strong imprint. This isn't an oversized balance, but it has an approx .040" larger diameter than the slimmer balances. Lever filler. ITEM #4352: SHEAFFER CADET TOUCHDOWN FILLING FOUNTAIN PEN WITH STUB MANIFOLD NIB IN CHERRY RED. This pen is unused and still has a chalkmark on the barrel. The medium nib has been changed out and replaced with an S1 Stub Manifold nib. ITEM #5420: WASP CLIPPER IN BROWN / GOLD CIRCUIT BOARD PATTERN. Lever filler with Wasp No. 3 Medium nib. ITEM #4622: SHEAFFER BALANCE SET IN EBONY PEARL. FLEXIBLE (not a wet noodle) FINE nib and gold filled trim. Very crisp imprint. Pencil uses .046" (1.1mm) leads. ITEM #4919: MEDITERRANEAN BLUE LEVENGER SEAS CONNAISSEUR FOUNTAIN PEN. First series. Medium+ Sheaffers Levenger 14K nib. Gold plated trim. Cartridge filling. Cat. no. 830.This item has minor stress cracks below the surfface near the top of the clip. These are shown in the photos below. Otherwise this pen is fully functional and the clip is anchored very tightly. These imperfections have not caused the clip to loosen or wobble. There are no voids or missing acrylic. ITEM #3756: LADY SHEAFFER V SCRIPSERT IN OVAL BOX LSF-1, WITH A MEDIUM NIB THAT'S ON THE HEAVY SIDE OF MEDIUM. A beautifully preserved example of marketing efforts, including a pouch with a clip. A great display item. Cartridge filling. ITEM #5184: SHEAFFER TARGA LACQUE RED RONCE FOUNTAIN PEN. A gorgeous marbled red metal pen w/ lacquer finish and gold plated trim. Very broad inlaid 14K nib. Cartridge filling. Catalog #1034. ITEM #5043: TARGA 1005N BALLPOINT. New old stock. Gold plated/gold findings. Twist action. ITEM #4430: SHEAFFER TARGA IMPERIAL BRASS BALLPOINT PEN NOS W/BOX. I had assumed this was a rollerball since it has a cap rather than a clicker or twist mechanism to propell the filler out. But I can find no Sheaffer rollingball fillers of a small enough diameter to fit this barrel, not even in my drawer full of old Sheaffer fillers. However, a modern Sheaffer ballpoint filler fits quite well. There is a slight distortion in the box lid. ITEM #4485: SHEAFFER 1952 #112SKY SNORKEL TRIUMPH MODEL. All gold filled and in immaculate condition. MEDIUM nib. No dents, dings, brassing, or personalization. ITEM #5125: SHEAFFER #8 BLACK FLAT TOP. FOUNTAIN PEN. Gold filed trim with a ASheaffer Lifetime seriaalized nib with a width on the boundary between Medium and Fine. Lever filling. Crisp imprint with bone colored white dot on top of the cap. High gloss, very clean ssurfaces. An impressive pen. ITEM #5243: SHEAFFER CARTRIDGE PEN. Flesh tone with chrome cap and trim. Medium steel conical nib coded "M8". ITEM #4707: SHEAFFER "VINTAGE" PATTERN BALLPOINT and PENCIL SET W/BOX. 12 K rolled gold in excellent condition with no known flaws; no brassing, no dents, mechanisms work great! ITEM #4912: NEW OLD STOCK SNORKEL STATESMAN SET IN GREY. Palladium sheath nib, medium. Gold snorkel. In box with instructions. Pen has "MEDIUM" sticker still on it. Never inked. ITEM #4247: SHEAFFER OVERSIZED BALANCE FOUNTAIN PEN IN BLACK. FINE Sheaffer lifetime nib, lever filling with gold filled trim. Immaculate condition. A very nice finish and very strong imprint.No brassing. 1/8" gold filled band. ITEM #3592: SHEAFFER BLACK OVERSIZED FLAT TOP LEVER FILLER WITH FINE SERIALIZED LIFETIME NIB. 5 3/8" LONG WITH CAP ON. .584" DIA. @ CAP BAND. ITEM #4400: NOS LADY SHEAFFER PLUNGER FILLING TUCKAWAY WITH PRICE STICKER STILL ON IT. Sheaffer labels this 14K two tone lifetime nib as a Medium. It registers just below Broad on a Parker factory nib gage. It has a wide gold filled band. A nice little cutie. ITEM #2881: SHEAFFER BLACK CHASED HARD RUBBER LEVER FILLING FOUNTAIN PEN. Srong chasing, crisp imprint, fine nib and excellent hard rubber color. A fine, intact example of an early Sheaffer. 4 1/4" long with cap screwed on. Capacity tests out @ .4 cc. ITEM #4280: NEW OLD STOCK SHEAFFER GOLD FILLED SOUVEREIGN CARTRIDGE FILLING FOUNTAIN PEN. Gold filled trim with 14K XFINE nib. Mint condition, no dents, dings, or brassing. Still has Sheaffer label on section/feed unit. ITEM #4876: SHEAFFER CONNAISSEUR IN BLACK. Medium 18K Sheaffer nib and gold plated trim. Includes Sheaffer Aerometric converter. ITEM #5020: SHEAFFER GOLD FILL LIPSTICK PEN. Medium two tone serialized Lifetime 14K nib. No dents or brassing. The cap on this pen switches from the front threads to a set of threads on the back for posting. Lever filling. ITEM #3805: NEW OLD STOCK SHEAFFER STERLING SILVER SOUVEREIGN CARTRIDGE FILLING FOUNTAIN PEN. Gold filled trim with Imperial XFINE steel nib. Mint condition, no dents, dings, or brassing. ITEM #4672: SHEAFFER VINTAGE PATTERN GOLD FILLED PENCIL. No dents or dings. Uses .036" (.9mm) leads. ITEM #4079: SHEAFFER PFM II IN BLACK. EXTRA FINE Palladium-Silver nib. No dents or visible scratches. Tests - out to .9 cc ink capacity. No known flaws. Very Excellent condition. ITEM #4249: SHEAFFER OVERSIZED FLAT TOP IN BLACK. Strong imprint, no brassing, and a MEDIUM SHeaffer lifetime nib. Lever filling.A very solid, good looking, shiney pen. ITEM #4390: NEW OLD STOCK SHEAFFER TARGA FOUNTAIN PEN AND ROLLINGBALL. - One pen body/cap with two different front ends allowing you to have either a BROAD fountain pen or a rollerball (Sheaffer called them "Rolling Balls"). The body has a gold plated close wavey line pattern. The nib is very BROAD and the filling mechanism uses cartridges. A Sheaffer Roller filler is included along with the additional Rolling Ball front end which is easily swapped out with the fountain pen front end. Understand that you're getting (1) barrel + (1) cap + (2) different front ends here. ITEM #4389: NEW OLD STOCK SHEAFFER TARGA 1008 / 16106 FOUNTAIN PEN AND ROLLINGBALL. - One pen body/cap with two different front ends allowing you to have either a BROAD fountain pen or a rollerball (Sheaffer called them "Rolling Balls"). The body has a small wavey line pattern in silver electroplate and it comes with the original price sticker. The nib is very BROAD and the filling mechanism uses cartridges. A Sheaffer Roller filler is included along with the additional Rolling Ball front end which is easily swapped out with the fountain pen front end. Understand that you're getting (1) barrel + (1) cap + (2) different front ends here. ITEM #4116: VERY EARLY NEW OLD STOCK BLUE SHEAFFER BALLPOINT WITH CLICKER TYPE ACTUATOR. Still has original "Feathertouch" price & "MEDIUM" size stickers. Uses a present day standard Sheaffer ballpoint refill, so it can still be used. Not polished. It has the original patina which could easily be cleaned-off. ITEM #4280: SHEAFFER GOLD FILLED IMPERIAL SOVEREIGN FOUNTAIN PEN. XFine nib, Cartridge filled. This is not the 50's era snorkel model, also called a Sovereign, but a 70's era re-use of the same name. Being the Cartridge filler Sovereign (as opposed to the Touchdown), this design has a slightly elongated diamond pattern. The Touchdown version has a more symetric diamond shape in the pattern. Gold filled trim with no dents, dings, scratches, or brassing on any of the metal. Pen is 5 1/8" long. (2) available. ITEM #4648: SHEAFFER NOS IMPERIAL STYLE PENCIL. Square cross section on top of cap. Grey w/ brushed stainless cap. Uses .036" (.9mm) leads. ITEM #3868: LENOX (CHINA) SHEAFFER DESK SET. White Lenox china made for sheaffer along with the proper Sheaffer BROAD triumph nib cartridge filling fountain pen. No chips in the china. Note the LENOX hallmark in the last picture. ITEM #4725: SHEAFFER COMP 1 CARTRIDGE FILLING PEN. Still has chalk mark. Medium nib and chrome trim.New Old Stock. ITEM #4422: BLACK HARD RUBBER SHEAFFER's SELF FILLING #2 WITH WIDE 14k BAND. Black hard rubber color is about 96%. Lever filling flat top. Initials "AAC" on band in block lettering. ITEM #3852: SHEAFFER PFM III, GREEN, XF NIB. Beautiful pen, beautiful color. Restored and working great. ITEM #4119: NEW OLD STOCK SHEAFFER GOLD FILLED SOUVEREIGN BALLPOINT WITH LEVER CLICKER. This pattern matches the more recent cartridge filling fountain pen as the diamond pattern is slightly elongated as opposed to the Touchdown version, which has a more symetric diamond in the pattern. Press lever on the bottom for actuation, on top for retraction. Mint NOS. 2 available. ITEM #4201: OLDER PATTERN NOS STERLING SILVER SOUVEREIGN BALLPOINT. This is the older pattern, compatible with the Touchdown Sterling Souvereign fountain pen, as it has a symetric shaped diamond in the pattern (The cartridge filling Souvereign set has a longer diamond in the pattern). A very nice ballpoint. The newer version (elongated diamond pattern) of the Sterling Silver Souvereign ballpoint is also available, NOS, for $85, Item #4134. The newer version (elongated diamond pattern) of the Sterling Silver Souvereign pencil is also available, NOS, for $75, Item #3809. ITEM #1566: SHEAFFER TOUCHDOWN DESK PEN IN BLACK. With FINE Triumph nib.Still ha part of the price sticker on the barrel. ITEM #3099: SHEAFFER SKRIP SAFEGUARD DESK SET REFILL - STILL SEALED and FULL. ITEM #4245: RARE SHEAFFER SKYBOY BALANCE PEN IN GREEN / BLACK STRIPES. With ACCountant width 14K Sheaffer nib. Has "1000" on the imprint, which was related to the price. This model was marketed during the rise in popularity of air travel; supposedly it wouldn't have accidents in the user's pocket during cabin pressure changes. There doesn't seem to be any difference in construction between it and Sheaffer's other lever filling models in this respect, though. I've never found one of these in the wild before, although I've read about them. ITEM #3853: BLACK PFM III WITH XTRA FINE NIB IN FINE RESTORED CONDITION. Another nice piece, restored and working. ITEM #2585-1566: SHEAFFER MODEL 501S BLACK CERAMIC DESK BASE W/ PEN. Fine 2 tone 14KTriumph nib. Touchdown filling mechanism. Either the base or the pen cab be purchased separately. $55 pen + base SOLD AMERICAN!!! ITEM #4257: SHEAFFER SNORKEL DEMONSTRATOR. NO CRACKS ! ANYWHERE! Not where the clip attaches, not near the threads, not on the cap lip ! No cracks at any of the usual places that these Snorkel demonstrators usually have stress cracks. Plus there is a strong imprint. The only flaw I see is that the black painted-on band that SHeaffer put on all of these to hide where the metal cap insert was glued-in is about 40% worn-off. It hasn't been polished off completely like most of them on other snorkel demonstrators have been. But if this bothers you, it can be easily buffed completely off. The plastic is not yellowed or fogged-up, either, and the insides are all clean and shiney. Plus it works. FINE Triumph type nib. ITEM #3781: 1947 SHEAFFER GOLD FILLED STRATOWRITER BALLPOINT. P/N 1-RA1. The clicker works; you push it down and turn it to hold the point out. The filler is dried-out. Purchased with an old pen sales/repair shop. No dings or dents. Solid. Beautiful condition. ITEM #3940: STRATOWRITER POINT COVER (FOR #3781, ABOVE). This was an afterthought by Sheaffer. A lot of people were ruining their shirts when the point came in contact with their pockets, so these were sent out to correct that. These are extremely hard to find, especially still wrapped in sealed cellophane. ITEM #PFM NIB & HOOD: BLACK PFM NIB & HOOD UNITS AVAILABLE IN FINE AND MEDIUM. All in great shape. Specify F or M. All are 14K. ITEM #3780: SHEAFFER BLACK PFM III, BROAD NIB (.056" AT TIP). This is one of those Sheaffer nibs with an almost perfect sphere on the tip, and this one is big. Nice pen, super nib. ITEM #3989:: SHEAFFER BLACK PFM III, BROAD/MEDIUM NIB (.032" AT TIP). A very nice looking pen with a great hand feel. Demonstrates above average ink capacity @ .80 cc (The average for PFMs is .72cc). This nib measures right between broad and medium on a Parker factory nib grader. ITEM #4239: WASP CLIPPER IN GOLD/GREEN/PEARL RIBBON PATTERN. Lever filler with MEDIUM gold wasp nib. The pattern is a three dimensional pattern of a gold tinsel type metalic and green pearl ribbons tangled up below the surface. Very eye-catching. Gold filled trim. Lever filling. A very nice pen. ITEM #3833: SHEAFFER BLACK PFM IV WITH EXTRA FINE NIB (.022" AT TIP). A great pen in excellent restored condition. ITEM #3572: SHEAFFER OVERSIZED BALANCE LEVER FILLER IN PEARL & BLACK. LIFETIME SERIALIZED NIB APPROACHING A MEDIUM WIDTH POIN, 5.5" LONG WITH CAP ON, .587" FAT @ CAP BAND. ITEM #3851: SHEAFFER PFM I, MAROON, BROAD NIB (.070" WIDE AT TIP). RESTORED AND IN VERY NICE CONDITION. ITEM #4117: VERY EARLY NEW OLD STOCK SHEAFFER BALLPOINT WITH CLICKER TYPE ACTUATOR. Uses a present day standard Sheaffer ballpoint refill, so it can still be used. Not polished. It has the original patina which could easily be cleaned-off, if that's your bend. ITEM #3695: A NOS SHEAFFER GOLD ELECTROPLATED VINTAGE PATTERN BALLPOINT & TWIST TYPE .9mm PENCIL SET IN PRESENTATION BOX. THE BALLPOINT IS CLIP ACTUATED. NO DENTS OR DINGS IN EITHER. VERY CLEAN BOX. 2 SETS AVAILABLE. ITEM #3913: SHEAFFER OVERSIZED BALANCE PISTON FILLER, BROWN / GOLD STRIPED. This pen has had both its piston washer and its' rear seal replaced with new old stock original sheaffer repair parts. Needless to say, it pumps & fills very well. Near mint condition. Two tone fine serialized nib. ITEM #3540: AN OVERSIZED SHEAFFER BALANCE LEVER FILLER IN GREY/BLACK STRIPES. FINE TWO-TONE SERIALIZED LIFETIME NIB. NEAR MINT CONDITION WITH CRISP IMPRINT. NICKEL PLATED TRIM. NO BRASSING. 5.52" LONG WITH CAP ON, .593" FAT @ CAP BAND. ITEM #3956: SHEAFFER STERLING SILVER SOVEREIGN IMPERIAL TOUCHDOWN IN DIAMOND PATTERN. With FINE inlaid imperial 14 K nib. This is not the 50's era snorkel model, also called a Sovereign, but a 70's era re-use of the same name. This pen has been tested and takes in 1.1 cc. Gold filled trim, no dents, dings, or scratches in the trim, cap, or barrel. No brassing on trim. VERY near mint condition. New Old Stock cap, barrel, & outer tube assembly. Pen is 5 3/8" long. ITEM #4083: SHEAFFER GOLF PENCIL IN GREEN / BLACK MARBLE. Mechanism works finne. Excellent condition. Uses .046" leads (.9mm). ITEM #3948: SHEAFFER OVERSIZED BALANCE IN BLACK . Two tone fine serialized nib and vertical translucent vertical ink view stripes. check on the clenliness of these venerably ambered clear stripes in the back lighted picture below. Piston filler was tested for volume and takes in a whopping 2.7cc of ink. Crisp imprint, gold filled trim with no brassing. Barrel & cap are remarkably scratch-free. The packing unit on this pen was drilled-out and replaced with a new old stock Sheaffer repairman's replacement plug and the piston & shaft were replaced with Sheaffer new old stock replacement parts, contributing to this pen's huge measured ink capacity. The piston (or "plunger" if you prefer the recent vernacular) motion is very tight. This item is in as good-a-shape as Sheaffer could have made it. ITEM #3493 (SET): SHEAFFER BALANCE RARE BLUE / BLACK MARBLE WITH WHITE VEINS. COLOR INCLUDES AREAS OF PURPLE, GREY, AND BROWN/GOLD MARBLE. LEVER FILLED PEN IS 4 1/8” LONG WITH SHEAFFER’S 3-25 FINE NIB. BOTH PIECES HAVE CRISP IMPRINTS AND BALL CLIPS WITH NO BRASSING. PEN IS FITTED WITH A SILICONE SAC TO PRESERVE THE COLORS. SET COMES IN A COOL CARDBOARD HINGED RED VELVET LINED BOX ON A PEDESTAL WITH FEET ON THE CORNERS. THE BOX IS IN INCREDIBLE SHAPE AND GREATLY ENHANCES THE SIGNIFICANCE OF THIS SET. A REAL EYE-POPPING PRESENTATION. ITEM #3937: SHEAFFER "VINTAGE" PATTERN PENCIL. Twist mechanism uses .9mm leads. No dents or dings. ITEM #3644: SHEAFFER SNORKEL DEMONSTRATOR NEW OLD STOCK, AS-FOUND AND WORKING! NOT RESTORED. PURCHASED AS PART OF THE INVENTORY FROM AN OLD STATIONERY STORE. YOU WON'T FIND ONE CLEANER THAN THIS, EXCEPT IN MY PERSONAL COLLECTION. THE BLACK BAND AROUND THE CAP IS NEARLY INTACT; SOME RUB-OFF ON THE BACK FROM SITTING ON ITS BACK FOR SO LONG. (MOST OF THESE HAVE THIS EXTERIOR BLACK COATING AROUND THE BOTTOM OF THE CAP SMEARED OR POLISHED-OFF - YOU MAY NOT HAVE KNOWN THEY HAD THIS COATING UNTIL YOU SAW THIS ONE). VERY CRISP IMPRINT. ITEM #3872: SHEAFFER BLACK HARD RUBBER "TURBAN" RINGTOP LEVER FILLER. This is one of those old Sheaffer lever fillers with the cuffed index finger pointing in the direction to turn the cap to get it off with the word "TURN" above it. This is a very early Sheaffer with a no. 2 "SELF FILLING" nib. The nib is a little light on irridium on the tip of the nib, but these SELF FILLING nobs in any size are so scarce I haven't been able to find a better one. This pen is 4 7/16" long with the capscrewed on and .51" dia at the cap. The gold filled turban has an incredibly detailed repouse floral pattern. ITEM #3869: VACUUM-FIL IN BLACK WITH SPIRAL SEE-THROUGH BARREL. This is a piston fill, made in Ft. Madison. A very nice, good looking pen with a heavy fine "VACUUM-FIL" nib. I can't find a way to get the spiral amber transparent window in the barrel to show up in the photos, but it is very clean & clear, just with an amber tinge. ITEM #3849: VACUUM-FIL IN GREEN/BLACK PEARL WITH VERY GOOD, EVEN COLOR. Fine VACUUM FIL nib. No brassing on the gold filled trim. ITEM #2568:SHEAFFER BALANCE COMBO, PEARL & BLACK WITH MEDIUM 5-30 NIB AND SILICONE SAC. VERY TIGHTLY WELDED HAIRLINE IN CAP LIP WHICH IS VERY HARD TO FIND, EVEN WITH MAGNIFICATION.